Carding is the heart of fiber processing! 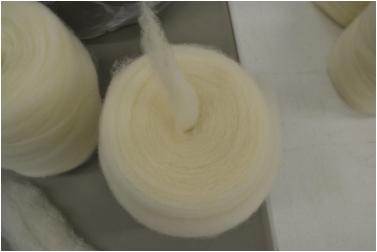 As your fiber proceeds through the carding machine, it is transformed from fleece into something more organized that is ready to be spun. Our carding machine is the largest piece of equipment in our mill. We had our carder custom-designed with an over-sized doffer and extra worker rollers to do a better job for you! 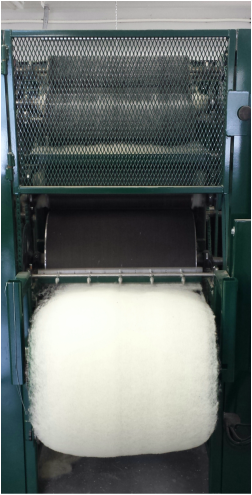 After washing/drying/picking, your fiber is fed into the carding machine and travels through a series of rollers. The rollers are "clothed" with little metal pins, rather like those on a dog's slicker comb. 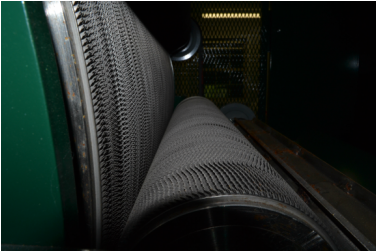 The action of the carding cloth, combined with the rollers, helps dislodge more vegetation from the fiber, and also straightens the fibers out so they are more lined up. You may wish carding to be the final step in the preparation of your fiber if you or your customers are handspinners. You have several choices for the final form of your carded fiber. See the list below for options for your carded fiber! If you wish, your fiber can be processed further through pindrafting or spinning. Choose this option if you would like your fiber to be processed into carded roving for spinning, The roving in the picture to the left has been wound into a center pull "bump" (a bump is an oblong-shaped center-pull ball of roving). There is an extra charge for bump-winding. Usually our bumps contain approximately 4 oz. of fiber. Roving can also be packed in a long coil inside of bags. You may prefer your carded fiber to be in the form of batts. A batt is a large rectangle of carded fiber. 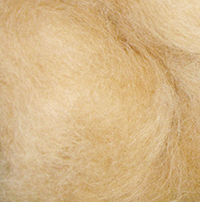 Some spinners prefer to spin from batts, and crafters who will be using the fiber for felting may also prefer this form. If you wish to use your carded fiber for filling quilts or comforters, this is the form for you! Typically, our batts measure about 2' x 5', and contain about one pound of fiber. However, we may add more or less fiber per batt, according to your preferences. It takes six of our batts to fill a queen-sized comforter. A number of our customers have asked us to restore antique wool quilt batts. We are happy to do this for you! We normally gently wash and re-card the antique batt(s), and provide new fiber to supplement the older fiber. A "cloud" is created when fiber is carded, but not organized into roving. Some customers prefer to "spin from the cloud," and some types of fiber (for example, very short-stapled fiber such as yak) is too short to be processed into roving, but still may be spun from a cloud. If you choose to have your fiber processed into a cloud, it will be shipped to you in a bag. NOTE; A few customers prefer cloud that is processed only by the picker, not the carding machine. But unless you tell us otherwise, we will assume you would like carded cloud.